Based on the interlocking chain of evidence we are presenting in this two page, intensively researched article, we believe that Brockwitz was the maker of the Four Flowers Variant (and the related Four Flowers Hybrid and Mystery Grape) as well as the glassware in the Goddess epergnes - Beaded Peacock Tail and Diamond Swirls. The probability is that they were made for just a few years in the early period of the factory, from circa. 1905. For decades we have tried to solve the mystery behind the maker of the Four Flowers Variant. We conducted surveys, wrote articles, examined hundreds of examples and postulated various likely makers. Curiously (and serendipitously) it was while we were researching the enigmatic Goddess epergnes, that we had an epiphany, a real “eureka” moment. So please, join us in the process of untangling the mysteries, and allow us to explain our conclusions. ​and right - a nine inch plate in green. GODDESS EPERGNES with sincere thanks for their help to Stan Hoegerman and Elaine Blair. ​Towards the end of 2015, we wrote a detailed research article about epergnes that combine a variety of metalwork with iridescent glass bowls and sometimes also epergne horns or lilies (the link to the article is at the bottom of Part Two in "Further Reading"). For a long time, the maker of the glassware on these fascinating epergnes has proved tantalisingly unattributed. The Goddess of Athena is possibly the most well-known, while two others are the Desert Goddess and the Goddess of Oz. ​Individual bowls are also known, both with and without the metalwork (some of which is stamped WMF for Württembergische Metallwarenfabrik of Geislingen in Germany, while others are not marked). Above: Goddess of Athena epergnes, in amber (left) and in green (centre) with Beaded Peacock Tail glassware, both courtesy of Elaine and Fred Blair. ​On the right is a purple Diamond Swirls epergne (courtesy of Stan Hoegerman). The colours of the iridescent glass bowls are green, amber and purple - each of which is known in several shades of the colour. Other important characteristics include the fact that the glass items are made from one-piece moulds (so they have no mould seams). ​The edges of the bowls are often crimped and may be even further ruffled. ​They also have ground bases, which indicates a key part of the production process. After removal from the mould these items were “stuck up” - they were attached by red-hot glass to a gathering iron (called a “heftnabel” in Germany, according to early Brockwitz literature) so that it could then be further shaped and iridised. 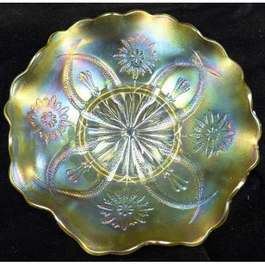 Speculation regarding the date of manufacture of these items is long-standing, but a New Jersey newspaper report describing a fruit dish in which a female figure in bronze supports “a tray of iridescent Bohemian glass” strongly suggests that 1907 (the date of the newspaper) was when these items were on sale in the USA. Allowing for marketing and transportation methods a century ago, we’re probably looking at 1905 or 1906 for their production. 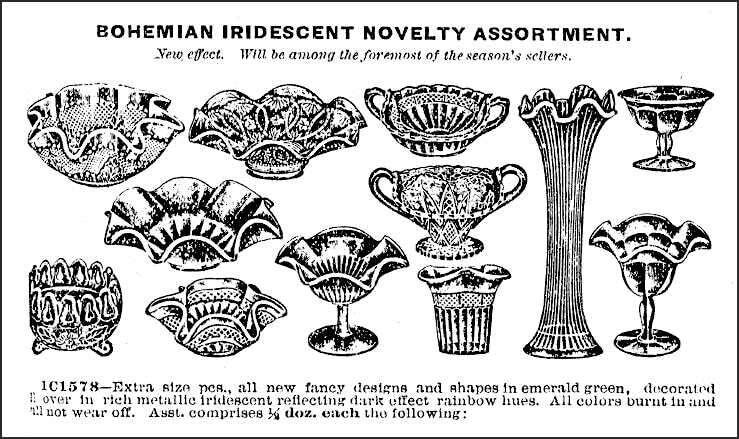 The description “Bohemian Iridescent” that was used for early Northwood Carnival Glass in this US 1909 wholesale ad from Butler Brothers (on the right) acknowledges the origins and influence of iridised glassware from Bohemia. The Breakthrough! Sincere thanks to Dieter Neumann for catalogue and other archive information throughout. In our Collectors Facts article on these epergnes, we showed a 1914 M. Liemann Department Store catalogue page featuring a goddess and other centrepieces, complete with iridescent glass. ​Now we can go further and show you the Beaded Peacock Tail and Diamond Swirls glassware, in the 1906 catalogue of Krug & Mundt (glass wholesalers), of Leipzig, Germany, below. Extract from Krug & Mundt's wholesale catalogue, 1906. Courtesy Dieter Neumann. The maker of the Four Flowers Variant (and the patterns associated with it, namely the Four Flowers Hybrid and the Mystery Grape) has long been a mystery. We have researched it for decades, sometimes feeling that we were nearer an answer, and yet never quite getting there. In the past, we’ve put forward Sowerby and Greener in England as possible makers, but despite great efforts and much time invested, we were still no nearer to an answer. We were updating our research into the Goddess epergnes and the glassware in them, when we had the sudden realisation that the colours of the Four Flowers Variant (and the patterns associated with it) were virtually identical to those of the Goddess glassware - Beaded Peacock Tail and Diamond Swirls. There are many shades of green including teal, ambers and yellow and all kinds of purples, even green and purple mixed – but no others. They share those colours exactly! It was something of an epiphany, and was surely of exceptional significance. 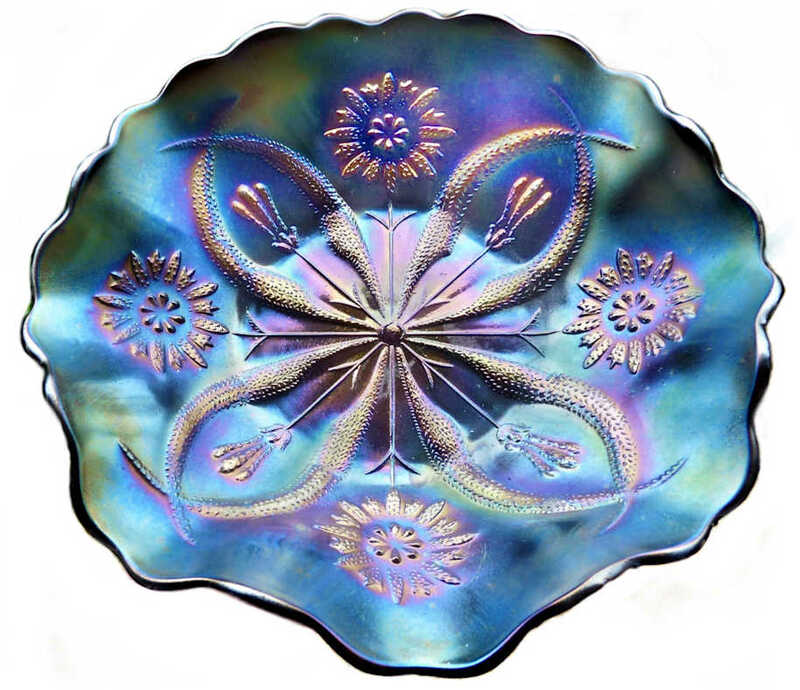 Then we realised that another very significant characteristic of the Four Flowers Variant (and Mystery Grape) was also shared with the Beaded Peacock Tails and Diamond Swirls glassware – that they were all made from one-piece moulds. 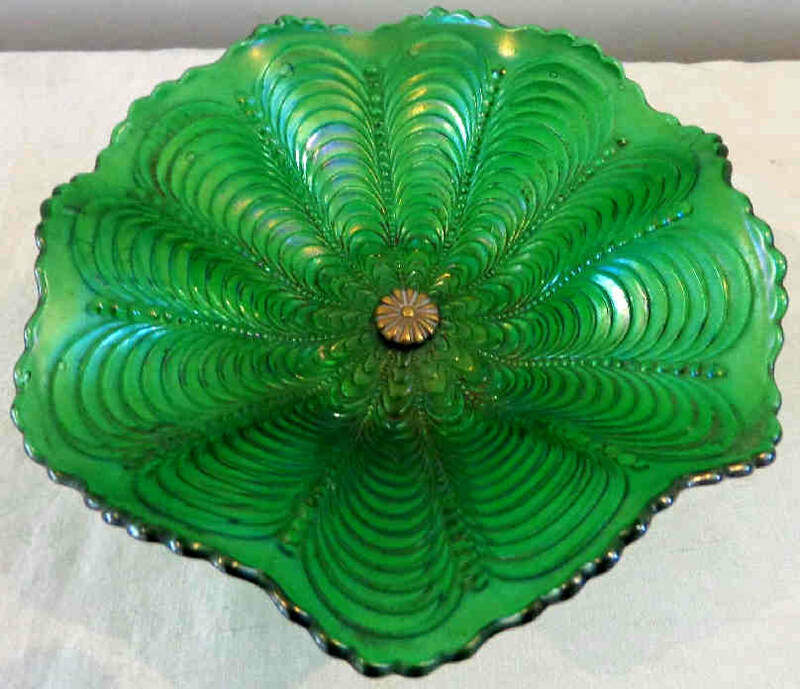 This is an unusual feature and is an important extra factor (most Carnival Glass was made from jointed moulds with several parts and thus exhibits mould seams). Furthermore, these items all share yet another characteristic; the glass is often a little streaky or appears to have flecks in it, as well as sometimes having air bubbles (all perhaps indicating a new factory still perfecting its processes). The identical and unusual range of very specific colours, coupled with the same characteristic of the one-piece mould (and resultant ground base) make it highly likely that the Four Flowers Variant (and the Mystery Grape) as well as the glassware mounted on the metal epergnes were produced by the same maker. And surely, following the Krug & Mundt lead, we were now looking to Germany. from WMF (Württembergische Metallwarenfabrik of Geislingen in Germany) alongside an amber Four Flowers Variant bowl. ​But naturally ... we needed much more evidence. Let's examine the distinct range of colours - shades of amber, green and purple - in which the epergnes and Four Flowers Variant have been found, and the strong similarities between them. Four Flowers Variant bowls in amber and (far right) yellow. ​Beaded Peacock Tail in amber, and (centre and far right) yellow amber. Photos courtesy of Wroda Auctions. ​Above: a green Beaded Peacock Tail horn and bowl, on this Desert Goddess epergne. ​Top row: left, a green Four Flowers Variant chop plate, and right, a teal Four Flowers Variant plate. Bottom row: left, a green Beaded Peacock Tail bowl (courtesy of “dealer-rita”), and right, a Four Flowers Variant bowl in green. Four Flowers Variant bowl in purple and (far right) a Four Flowers Variant plate in purple. ​Beaded Peacock Tail in purple, and (far right), detail from a purple Diamond Swirls epergne, courtesy of Stan Hoegerman. ​This astonishing photo, provided courtesy of Dieter Neumann, is the Brockwitz Mould Shop in 1910. It gives us various pieces of information of critical importance! Firstly, it shows us the scale of mould-making at Brockwitz - it shows that (at least) thirty men were working in the Brockwitz Mould Shop. That’s a large number, and clearly indicates both the high volume of production at that early date, as well as the importance the factory placed on producing its own moulds. Secondly, a vital piece of evidence can be seen bottom left of the main picture (and shown in the enlarged extract, above right). The worker is proudly displaying the mould for “Imperat” (we know it today as Northern Lights), and it is a one-piece mould. Here we have clear photographic proof that Brockwitz were making their glass using one-piece moulds in their early years. We have a Northern Lights bowl that has no seams and was made from a one-piece mould, and several other Brockwitz pieces, such as the marigold Sungold Floral bowl shown on the right. Later items, c. 1920s, were made from jointed, multi-part moulds. The glassware on the Goddess epergnes and the Four Flowers Variant (and associated patterns) were all made from one-piece moulds - a technique and a process that was clearly employed in the Brockwitz factory. The Krug & Mundt catalogue that features the Beaded Peacock Tail and Diamond Swirls pieces was dated 1906. Our thoughts turned to Brockwitz, situated around 60 miles or so from Leipzig where Krug & Mundt were located. Founded in 1903, the first glass had been poured at Brockwitz in 1904. ​The glassworks grew quickly, taking on many skilled workers from the just-closed Radeberg works, and steadily increasing their share capital. The earliest known catalogue from Brockwitz is dated 1915. ​Just what were they producing in the eleven years prior to that? ​A Parisian glass and china wholesaler, E. Val & Cie, issued a catalogue in 1905 that featured a range of goods from various makers including a number of items we can recognise as Brockwitz - see right. Crucially, we can see the Thumbprint pattern, in the form of a butter dish #1183. It is flanked by two Brockwitz butters that are known in Carnival - Stippled Clover and Gothic, #1182 and Tartan. #1184. Even more interesting is the fact that several other items in the catalogue are noted as being “Iris” (iridescent). Detail from the 1905 E. Val & Cie catalogue. ​And then we realised there was a vital piece of catalogue evidence staring us in the face – the Thumbprint exterior pattern. In fact, this particular piece of evidence has been in our sights since 2009! Collector Martin Hamilton had noted that the exterior design on the Four Flowers Variant (and also on the Mystery Grape) was identical to a Brockwitz pattern called Oliven. We agreed with Martin and chatted about it, but there was no other evidence at the time; but now … let’s take a look at this vital and pivotal element of the entire puzzle - the Thumbprint exterior pattern. The Brockwitz Oliven pattern was shown in their 1915 catalogue in a range of shapes, including a round bowl and plate, both of which were offered in a wide array of sizes. Martin notes that the diameter of the plates shown matches the two sizes of Four Flowers Variant plates (24 cm / 9.5 inches and 27 cm / 11inches), while the smaller ones approximately match the Four Flowers Hybrid and Mystery Grape. Note also that the Oliven pattern had a scalloped edge and a star base, just like the exterior of the Four Flowers Variant and Mystery Grape. These round plates are only shown in that early 1915 Brockwitz catalogue. Although the Oliven pattern featured through the 1920s for Brockwitz, it was only shown in a much smaller range of shapes and crucially, not the round plates and bowls that were in the early catalogue. Thumbprint pattern, exterior to Four Flowers Variant. The elongated thumbprints, the star base, the scalloped edge – that’s it. There’s no mistaking it. This is clear catalogue evidence from Brockwitz for the exterior pattern, the marie and the scalloped edge shaping on the Four Flowers Variant, Hybrid and Mystery Grape. The evidence showing that Brockwitz made the Beaded Peacock Tail and Diamond Swirls glassware for the Goddess and other epergnes is substantial and significant. There is a very strong and direct link between the very distinctive colour range of the Goddess glassware and the Four Flowers Variant – as well as several other important shared characteristics, which powerfully indicate that they were all produced by the same glass maker. Importantly, we also have catalogue proof that Brockwitz made the Thumbprint exterior design and used one piece moulds. We can’t escape the compelling chain of interlocking evidence that leads us to conclude that Brockwitz made the Four Flowers Variant, the Four Flowers Hybrid, the Mystery Grape as well as the glassware for the Goddess and other epergnes, namely the Beaded Peacock Tail and Diamond Swirls patterns, probably for a short time in the early years of the factory, from circa. 1905. This is deeply significant in many ways. Not only are we proposing that we can assign a maker to these previously unattributed items, we are also putting forward the assertion that Brockwitz began producing iridescent, moulded glass - Carnival Glass - much earlier than previously thought, and potentially as early as 1905. This shouldn’t come as a surprise, as the origin and subsequent production of iridescent glass was focused strongly on Europe. Iridescence on glass was first produced in Bohemia in 1856, when Leo Valentin Pantocsek created a technique for iridising glass. Many glassmakers copied this discovery, including Edward Moore in England, who we believe made the first press moulded, iridescent glass in the 1880s. 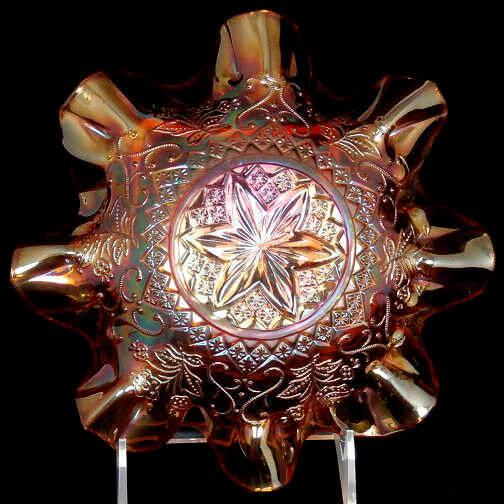 Many other glass makers in Bohemia and surrounding regions, are famed for their production of iridescent glass through the late 1800s into the early 1900s, such as Kralik, Loetz, Rindskopf and more. That Brockwitz would have been making iridescent glassware from its early days c.1905, is to be expected. ​Read Part Two: The Devil's Advocate where we test our conclusion against a range of questions, counter-arguments and challenges. In fact, the questions and the additional information revealed by the answers do nothing to disprove our conclusion - in reality they provide further evidence to support our conclusion!